LOS ANGELES, CA--(Marketwired - Feb 19, 2016) - Just over 50 years after the release of João Gilberto's and Stan Getz's classic Grammy®-winning album Getz/Gilberto (1964), and its sequel Getz/Gilberto #2 (1966, both on Verve Records), Resonance Records proudly announces Getz/Gilberto '76, set for release on February 19, 2016. Getz/Gilberto '76 is an instant classic collection of never-before-released recordings captured May 11-16, 1976 at the legendary San Francisco jazz club Keystone Korner, showcasing the legendary Brazilian singer, guitarist and composer João Gilberto, accompanied by the saxophone icon Stan Getz and his rhythm section of pianist Joanne Brackeen, bassist Clint Houston and drummer Billy Hart. 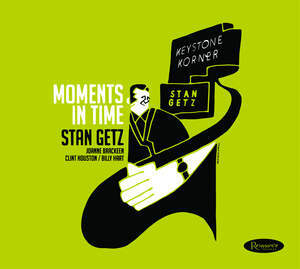 These recordings were made during João Gilberto's and Stan Getz's weeklong engagement at the Keystone, which took place nearly 12 years after the release of their initial award-winning album. The first Getz/Gilberto album sold over one million copies and almost single-handedly launched the bossa nova craze in America and around the world. It's been said that the hit single off that album, "The Girl From Ipanema," is the second most recorded song of all time, behind only "Yesterday" by the Beatles. The 1976 Keystone engagement represents one of the very few times this famed duo reunited after their initial creative collaboration in 1962, and according to the club's founder and owner Todd Barkan, this engagement was João Gilberto's first public performance after a four year hiatus. Getz/Gilberto '76 is available as a deluxe CD and limited-edition 12'', 33-1/3 rpm LP mastered by legendary engineer Bernie Grundman and pressed on 180-gram vinyl at Record Technology Incorporated (R.T.I.) in a limited edition of 2,000 copies. Also available digitally. The famed jazz club Keystone Korner, located in San Francisco's North Beach neighborhood, opened its doors in 1972 and operated until 1983. The Keystone hosted an impressive roster of jazz greats, among them Miles Davis, Bill Evans, Art Blakey, McCoy Tyner, Bobby Hutcherson, Joe Henderson, Freddie Hubbard, Herbie Hancock, Rahsaan Roland Kirk and many, many others. Barkan captured on tape live performances by the greats who appeared at the Keystone, collecting a virtual goldmine of archival treasures. In 2011, producer Zev Feldman and the founder/president of Resonance Records, George Klabin, collaborated with Barkan to release a few of those gems on the Resonance label. To date, these include Freddie Hubbard's Pinnacle (2011) and the Jaki Byard/Tommy Flanagan two-piano collaboration The Magic of 2 (2013). After several years of patient relationship building, Barkan shared one of his most prized recordings with Resonance -- tapes documenting a week of performances by the Stan Getz Quartet with special guest João Gilberto from May of 1976. These tapes are truly the "crown jewels" of Barkan's archives, and represent one of the few times in their careers that Getz and Gilberto collaborated. Recognizing the significance of this special engagement, Feldman and Klabin made it their mission to share these recordings with music lovers in two special, deluxe releases. Feldman on Getz's legacy: "We really wanted to give Stan Getz the royal treatment with these deluxe releases, and we're honored to be able to add a new chapter to his timeless musical history. He's simply one of the greatest saxophonists who ever lived and deserves to be heard by new audiences with each generation so that his legacy continues to grow and grow. Even John Coltrane was a fan and said 'We'd all sound like that if we could!'" And on working with co-producer Todd Barkan on these releases, Feldman adds humorously, "It took a few years of George [Klabin] and I staring over at the corner of Todd's archives and salivating over those Getz tapes when we would come by, and he'd just say something like 'Oh, we can talk about those later.' We're so thankful our persistence paid off in the end, and grateful not only for the amazing tapes Todd has shared with us, but the great relationship we've built over the years." Resonance worked tirelessly over a number of years tracking down all the appropriate parties to ensure that both Getz/Gilberto '76 and Moments in Time were fully endorsed and cleared by both João Gilberto and the Stan Getz Estate, and the living musicians involved. Both albums will be released on the same day, with Keystone's Barkan as co-producer on each. Resonance's historical releases typically include elaborate books featuring newly commissioned essays, personal accounts of those involved in the creation of the music and the recordings, and rare archival photos that provide listeners with a detailed historical context of everything that went into making that music. These extensive books have become a defining characteristic of each Resonance historical release, and 2014's John Coltrane: Offering Live at Temple University even garnered the label a Grammy award for Best Album Notes (by Ashley Kahn). Likewise, Getz/Gilberto '76 includes a 32-page book featuring essays by producers Feldman and Barkan, Stan Getz's son Steve Getz, author and jazz authority James Gavin, as well as interviews with Brackeen, Hart and bossa nova legend Carlos Lyra. Included in the package are rare, previously unpublished photographs by San Francisco's heralded music photographer, Tom Copi. The deluxe gatefold LP features striking photos from Tom Copi, and a beautiful painting ("Equilibrium Verde") by the late celebrated Puerto Rican abstract expressionist artist Olga Albizu graces the cover. Her paintings also appeared on the album covers for the original Getz/Gilberto and Getz/Gilberto #2 releases and Stan Getz and Charlie Byrd's first Brazilian-music collaboration, Jazz Samba (1962). Bossa nova (Portuguese for "new trend") became enormously popular in the in the United States beginning in the early 1960s thanks largely to Stan Getz's 1962 releases, Jazz Samba (co-led with Charlie Byrd) and Big Band Bossa Nova (Verve). Jazz Samba, one of the first important bossa nova releases in the United States, included arrangements by guitarist Charlie Byrd, who had recently traveled to Brazil and been exposed to bossa nova, and featured compositions by noted Brazilian composers. Bossa nova, then a novelty for Americans, combines many American jazz elements with traditional samba structures yielding a light, syncopated groove that, while reminiscent of classic samba, is lighter and more intimate. This new sound immediately captivated American audiences and caught the attention of jazz and pop fans alike. It was also quickly adopted by many top jazz and popular musicians, including Frank Sinatra, Dizzy Gillespie, Quincy Jones and even Elvis Presley. By August 1, 1964, Stan Getz's single "The Girl From Ipanema" (by the preeminent Brazilian composer Antônio Carlos Jobim), drawn from Jazz Samba, hit the Billboard's top ten list alongside the Beatles, Dean Martin, Roger Miller and the Supremes. Stan Getz's smooth tenor saxophone sound became synonymous with bossa nova in the United States. In Billy Hart's interview with Feldman, he notes, "Stan was considered by many as the number one tenor saxophone player in the world at that time." A decade earlier, in the 1950s, João Gilberto was refining the bossa nova sound in his home country of Brazil. His guitar playing de-emphasized the percussive quality of samba, while creating a lightness to the syncopated rhythms that defined the new sound. In the album book, author James Gavin writes of Gilberto's unearthly calm: "João had already become a mythic figure. A nondescript man in a dark suit, he looked like he could have been a banker. Instead, this eccentric genius, reclusive and painfully shy, had changed the course of Brazilian music . . . His vibratoless, nasal-toned, sotto voce croon floated with seeming detachment above his guitar. The push-and-pull between the two was a marvel of rhythmic and melodic tension and release." Gilberto recorded several of Jobim's songs and launched the bossa nova movement in 1958 in Brazil with the recording of "Chega de Saudade," showcasing his groundbreaking guitar style on a record by Elizeth Cardosa. This song became a celebrated single. Billy Hart describes João Gilberto as the "Frank Sinatra of Brazil." 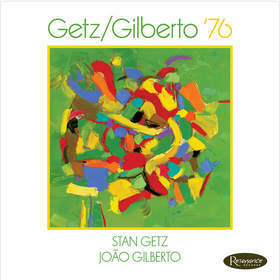 Stan Getz and João Gilberto joined forces in 1963 to record Getz/Gilberto. Their artistry, talent and broad appeal with the public that each of them enjoyed combined to create a national sensation in the United States. In his essay for the Getz/Gilberto '76 package, James Gavin paints a portrait of João Gilberto in performance: "Gilberto sat on a stool, head hunched over his guitar, drama-free except for his spacey, enigmatic presence. His music was wistful but cool; Gilberto was a man of secrets. That seeming detachment lent irony to the tortured songs he loved. In 'É Preciso Perdoar' (One Must Forgive) -- written in the mid-'60s . . . popularized by Gilberto -- Gilberto sings in his humming head voice: 'Dawn has already broken/You're going to abandon me/I feel you don't deserve forgiveness/I wanted the illusion, now I am the pain.'" Getz/Gilberto '76 begins with Stan Getz introducing João Gilberto as "the most individual singer of our time -- a true originator" and muses over how "a performer, so gifted, one of the true greats in music should be so hesitant about public appearance, is just one of those mysteries. But he's here this week." 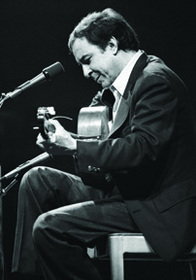 The album begins with "É Preciso Perdoar'" followed by the popular Jobim compositions "Águas de Março" (Waters of March) and "Retrato em Branco e Preto." The 13-song album includes such bossa nova favorites as "Chega de Saudade," "Doralice" and "Eu Vim da Bahia." With these songs, Gilberto and Getz seduce the audience with their incomparable artistry. The passage of time has only served to underscore the magnitude of what they achieved, first in the '60s and then here, ten years later at the Keystone in their rare joint appearance. Steve Getz nicely summarizes this album: "This recording is a jewel; it's a demonstration of the natural musical chemistry between João and my father. And it's particularly fine that they were able to make this recording with Joanne Brackeen, Clint Houston and Billy Hart, my father's stellar sidemen of the day, in a restrained but relaxed backing of the Brazilian master." As a companion to Getz/Gilberto '76, on February 19, 2016 Resonance Records will also release the deluxe CD Moments in Time. This album was also recorded at the Keystone Korner, the same week as Getz/Gilberto '76 and features Stan Getz's same adventurous rhythm section. Moments in Time and Getz/Gilberto '76 document the only time this dynamic quartet recorded together. The accompanying 28-page book includes essays by producers Feldman and Barkan, journalist Ted Panken, a tribute by Steve Getz, interviews with Brackeen and Hart and statements from saxophonists Branford Marsalis and Joshua Redman. The album cover is beautifully designed by the acclaimed Japanese artist Takao Fujioka. Ted Panken describes Moments in Time as capturing the artists on this recording as a "unit of thirty-something masters-in-the-making." Keystone's Barkan recalls: "Stan explained to me quite a few times backstage at Keystone Korner that 'I have never felt as free and as totally supported as I do with this band with Joanne Brackeen, Clint Houston, and Billy Hart. They are happy and free to go with me wherever I go . . .'" Barkan relates that Getz frequently told him that he felt the most comfortable at the famed San Francisco club, more than he did at any other club. Brackeen talks about playing with Getz in her interview with Feldman: "I think that it kind of really also displays the quartet at its best, which we rapidly became and stayed. And he had to be really daring to hire us. He already had his thing. He was already famous. He didn't have to have this band. And this band was crazy! I mean, we would do anything and everything we possibly could. We weren't just there as accompaniments . . . And then you hear how he played on it, it's so lyrical. He doesn't play one note that he doesn't mean. At any time. That's the one thing I guess that I would say about him that was so unique to me. And he also talked that way, when he was speaking." The release features eight tracks, including Antonio Carlos Jobim's "O Grande Amor," Wayne Shorter's "Infant Eyes," Horace Silver's "Peace," Dizzy Gillespie's "Con Alma," Jimmy Rowles's "Morning Star" and others. These tunes were staples of Getz's repertoire and remained so for many years. Also available digitally. In his contribution to the album package for Moments in Time, saxophonist Joshua Redman pays homage to Getz: "His virtuosity -- he could play any tune in any key at any tempo, with command and control and a sense of relaxation." And he further celebrates Getz's ". . . incredible storytelling ability -- the natural, organic logic in the flow of his phrases and ideas." Resonance Records is pleased to unearth these notable historic recordings of Stan Getz/João Gilberto and the Stan Getz Quartet and to share them now with the public. Resonance Records continues to bring archival recordings to light. 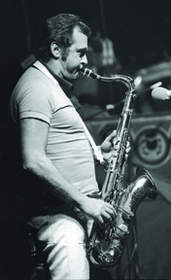 Some past releases include the critically acclaimed 2015 Grammy® award-winning John Coltrane release, Offering: Live at Temple University (Grammy® for "Best Album Notes," by Ashley Kahn), Wes Montgomery's One Night in Indy and In the Beginning, Charles Lloyd's Manhattan Stories and Bill Evans's Live at Art D'Lugoff's Top of the Gate. Photo by Tom Copi/San Francisco.